The enchanting city of Granada is home to a number of superb markets, at which you can buy everything from spices to jewelry. Here are the ones that every bargain-hunter needs on their list when visiting the city, as well as a couple extra that offer something a little bit special. Situated just opposite Granada’s huge cathedral is Mercado San Agustin, the city’s best food market. This densely-packed cluster of stalls sell meat, fruit, vegetables, olive oils, cheeses, and wines of the highest quality, and is also home to some excellent little tapas joints, providing drinks and snacks in between purchases. The market informally creeps out into the surrounding streets, with colorful stalls selling yet more fruit – including pomegranates, or “granadas” – and vegetables, flowers, and spices. Shopping at San Agustin is a hugely enjoyable experience, and one that should not be rushed. 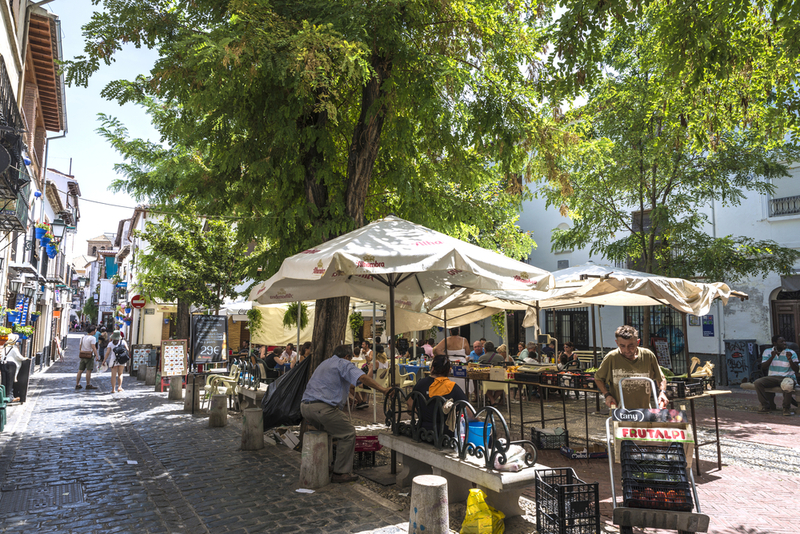 Every couple of months, intriguing arts and crafts fairs take place on two of Granada’s prettiest squares. One of these is on Plaza Romanilla, a beautiful space underneath the cathedral’s lone tower and known locally as “Donkey Square” (it’ll be obvious why when you visit). The other is on the Paseo de los Tristes, a spacious plaza/promenade that stretches along the Darro at the foot of the Alhambra and the Albaicín barrio. At both of these markets – usually held on Saturdays and publicized in local media beforehand – you can find original works produced by Granada’s most innovative, up-and-coming painters, sculptors, jewelry makers and photographers; snap one up and, who knows, in a few years’ time you might be sitting on something worth a small fortune. Now confined to a few narrow alleyways between the cathedral and Plaza Bib-Rambla, the Alcaiceria used to be Granada’s Grand Bazaar. Here, on a site that originally stretched all the way to Plaza Nueva, the finest herbs and spices from north Africa were sold alongside Arabic silks, fabrics and ceramics. The Grand Bazaar burnt down in the 19th century – owing to a fire in a matchstick factory, of all things – and although the modern-day Alcaiceria is a fraction of the size of its sprawling predecessor, it’s still the best place in Granada for spices, spice blends, herbs and herbal tea mixes. 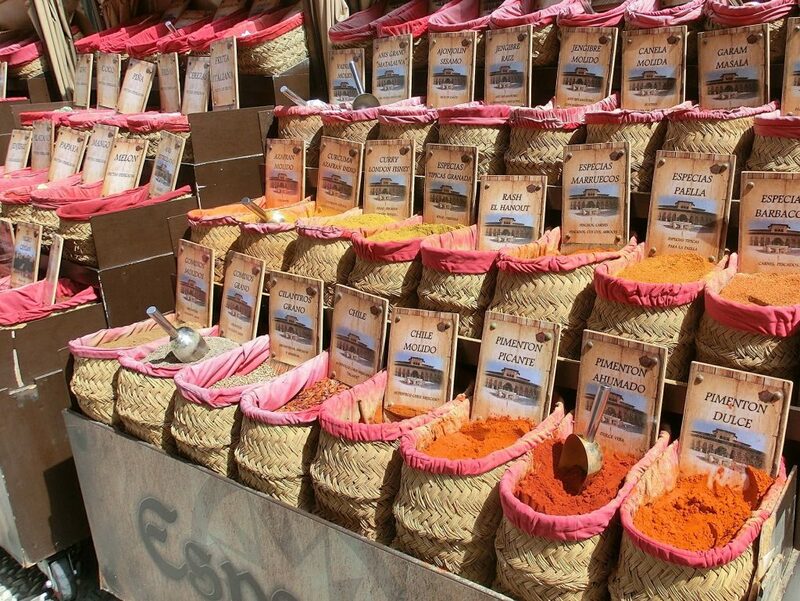 The spice shop, Medievo, also runs a well-stocked street stall under the shadows of the cathedral, selling various types of ground peppers, paprika, curry blends and saffron. 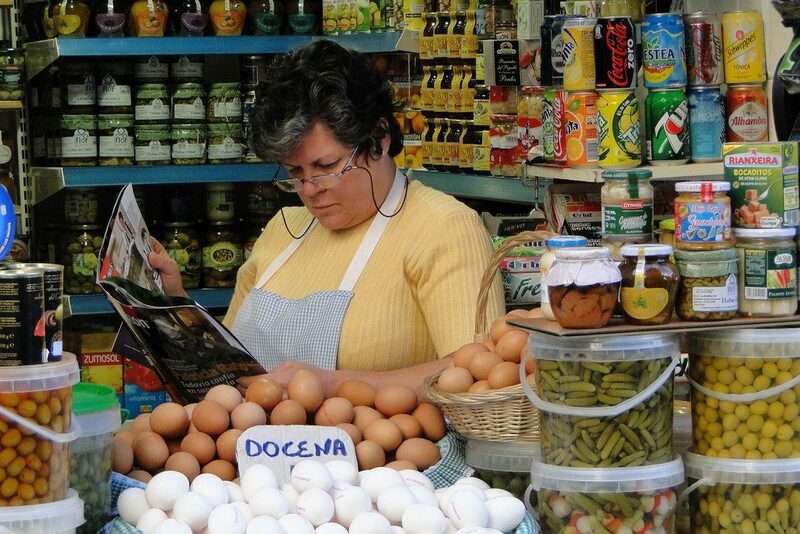 Plaza Larga’s weekly, Saturday morning food and flower market is a happily chaotic affair – one which saves locals the ordeal of heading down into the center to shop, then returning up the punishing Cuesta del Chapiz hill with their purchases. This market is unbeatable in Albaicín (Granada’s former Arabic quarter) for vegetables, fruit and flowers, all of which are attractively displayed next to Arabic fabrics and ceramics (and sometimes pirated CDs and DVDs). It also happens to take place on this barrio’s most bohemian square – a space in which clouds of marijuana smoke drift around from the local hippies’ joints, making your shopping trip that much more interesting. Just down the street, on Calle Panadero, there are also some superb little shops selling bread, organic olive oils, and wines. Granada’s delightful Christmas market will charm even the most cynical of Scrooges. Every year, from the first week of December until January 5, Plaza de Bib-Rambla is home to a vast number of stalls selling nativity scenes hand-carved out of wood, traditional sweets and cakes, handmade jewelry and leather goods, as well as various toys and souvenirs with a Christmas theme. There is also often a huge Christmas tree at the plaza’s center, around which large groups of Granadinos volubly exchange season’s greetings. Even if you just fancy a wander around, the atmosphere on Bib-Rambla throughout December makes visiting this market a pleasure. Most years there is also a stall run by local nuns outside the Correos post office on the Puerta Real de España, from which you can buy biscuits and other sweet treats. Spaniards love a good medieval market, and Granada’s is one of Adalusia’s biggest and best. Held every summer (usually in July, but check local media for details) on Plaza de Bib-Rambla, this gastronomic blow-out features enormous BBQs and several spit-roasts on which entire hogs slowly rotate. To really get into the spirit of things, many stall owners are kitted out in full medieval attire, making for a great atmosphere and plenty of fun photo opportunities. There are stalls selling handmade leather and wood artifacts too, but the smoky aromas emanating from the food stands will distract your attention until you’ve had a boar-burger or a steak to take the edge off your hunger. Quite simply a wonderful morning or afternoon out.